Increase your success! 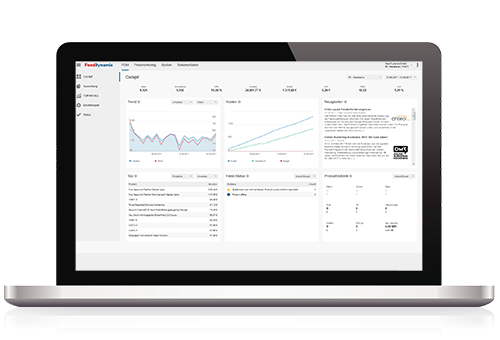 With the Feed Engine, you can generate perfect data feeds for any sales and marketing channel and start your campaigns on relevant channels such as price and product search engines, Google Shopping, retargeting providers, or social media. You will not need to resort to your IT & development resources and will improve your marketing performance with better product information. Perfect data feeds for any channel! Data import forms the starting point. Simple and comfortable feed merging allows you to process your product data from different sources regardless of their format and form them into a uniform master feed. You can verify your product data at any time via the preview function. For automatic mapping of product data, the Feed Engine offers all attributes necessary for this. You also have the option of adding further data fields. With optimal product information, you will pique the interest of your customers, improve the customer experience, and thereby strengthen your marketing performance. With the Feed Engine, you can comfortably optimize several thousand product data sets individually for every export partner through predefined functions and templates. At the same time, we offer all essential tools for standardizing attribute values according to the respective specifications. Maximize the profitability of your marketing measures by optimally managing your products and prices on all distribution channels. The Feed Engine offers the option of the highly granular management of product data feeds. You define the business rules as desired based on all information contained in the data feed and current KPIs. In addition, you can take data from your business intelligence into consideration when optimizing your data feed. With just a few clicks, you can create data feeds for any number of marketing channels. The Feed Engine automatically converts your product data into the required formats and makes these available. We ensure that the right partner receives the right data at the right time and in the right quality through extensive validations. The update is carried out automatically according to a freely definable update cycle. Import product data from various sources and create your master feed. With predefined functions, you can comfortably optimize thousands of data sets and prepare these for specific channels. Implement complex data optimization, for example by completely rewriting product titles or descriptions. Standardize product data such as categories, colors, or sizes according to your partners’ requirements. Increase your sales by integrating voucher codes and discount prices. Configure individual business rules for managing your data feeds according to attributes of your choice. Define products or categories to be removed or added to your data feed. By integrating individual KPIs or attribution models, you can control your data feeds in a success-oriented way. For every portal, you will receive an overview of agreed on conditions such as CPC or minimum revenue. Based on conditions, you can determine individual commands for portals with CPC bidding support. Every partner receives the right data. Comprehensive validation options secure the quality of your data feeds. The Feed Engine flexibly converts your product data into the required formats and makes these available. You can define individual update cycles for a high-frequency transmission of your product data to your marketing partners. Event logging enables collaborative work and makes every working step transparent. Detailed reports depict performance values in all dimensions and enable individual evaluations. Professional data feed management for your online shop. We are Feed Dynamix, your specialist for product data handling, optimization and management. We support retailers, manufacturers and platforms in using the full potential of their data, reducing complexity, and at the same time efficiently implementing their resources.